Ah! 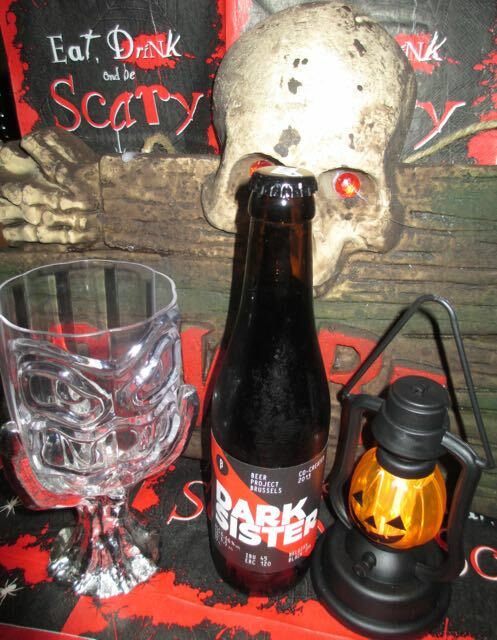 The Halloween season is upon us and I have the honour of starting this two-week round of blogs with this scary and yet tempting sounding brew. Brewed for the Beer Project Brussels and kindly delivered to my door by Beer 52, and without me having to hardly leave my armchair on a dark stormy night. So the label states that this Dark Sister is Delta’s evil twin and described as an obscure temptress. Sounds like a naughty lady indeed; one to keep away from and yet be strangely drawn to at the same time. Must be great at parties! Anyway, back to the beer. Served in a 330ml bottle and at a devilish sounding 6.66% volume, this Dark Sister is made with Pale, Cara and Choco malts making for an almost black beer that poured like an excitable wicked maiden into my beer glass and almost overflowed. The hops used in the brewing were those of Challenger, Smaragd and Citra, with Belgian Saison yeast used in the fermentation process. On tasting there was a passionate chocolate and bitter coffee flavour from the malts, which had a sudden cutting finish like a dagger or a shot in the heart from an evil temptress’s hidden Derringer. This crisp flavour from the Saison yeast was almost immediately replaced and also complemented by the snappish fruity citrusy bitter hops that moved skilfully into the aftertaste. I could just imagine the red satin sheets to hide the bloodstains and a just finished glass of Dark Sister on the bedside cabinet. What a way to go!